Beaches, waves, warm sunshine and of course, Mermaids! 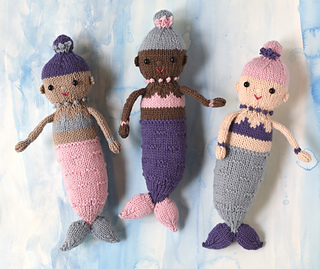 In these warm beachy months of summer it seemed the right time to create an adorable trio of Mermaids. 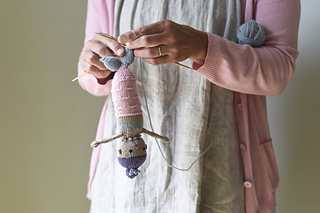 These little mermaid dolls are knit seamlessly from the bottom-up with the arms, fins, ears and crown being picked up and knit on. The instructions provide exact placement for all of the appendages and eyes and instructional photos are included to help along the way. There is a necklace of pearls (or maybe French knots!) embroidered on afterward and there is a video tutorial link for this technique included in the pattern. 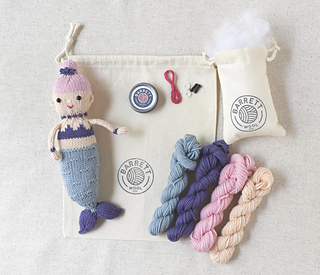 Instructions include simple guidelines for making a Merman, if interested. 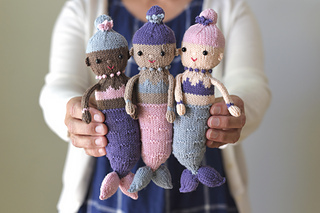 I hope you enjoy knitting these lovely little Mermaids. They make for a joyful set!